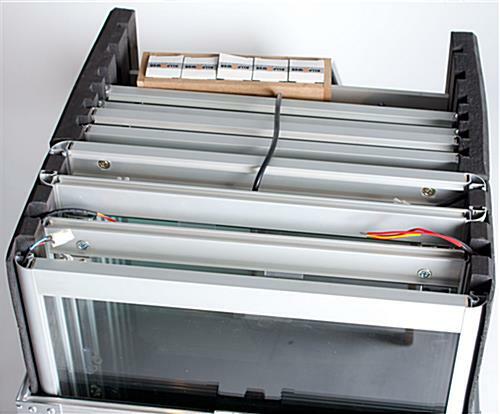 This Display Cabinet Ships Unassembled in a Traveling Case! Browse this Online Catalog for Hundreds of Retail Stand Options! Most in Stock Items Including this Display Cabinet will Ship Fast! 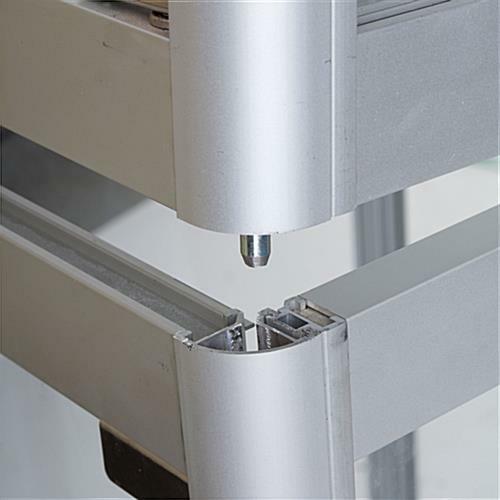 Tempered glass and aluminum profile for quality construction. All necessary hardware is included for setting up unit. This display cabinet comes unassembled in a case for transporting. 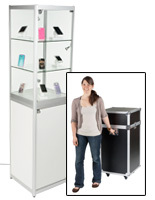 These mobile showcases are made of tempered glass with an aluminum frame to create a high quality tower. 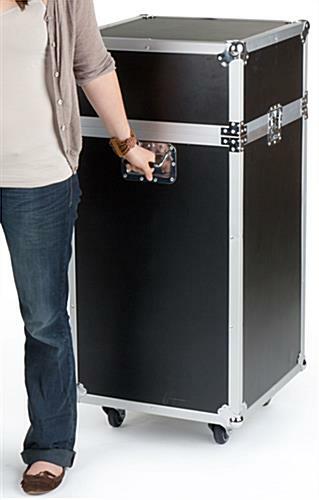 Each retail case is a display cabinet that has (2) hinged locking doors to keep the items safe inside. These traveling showcases have a silver melamine finish on the base and top to coordinate in all settings. Each display cabinet with LED lights on the sides as well as the top truly enhances the collections being shown. LED bulbs are cheaper to use than halogens since they last longer and use less electricity. 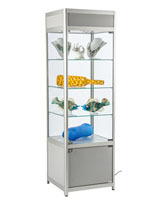 This display cabinet, mobile showcase has fixed glass shelves supported with rubber padding. The space between the shelves is large enough for most items. Each glass tower is a display cabinet that has adjustable feet. The (4) feet are used as levelers on uneven floors to stabilize the unit. Since this display cabinet is mainly used for tradeshows, it is ideal to be able to keep the furniture stable, no matter what the flooring is like. The traveling containers with these towers are equipped with wheels for easy mobility, including a locking gasket to secure in place. 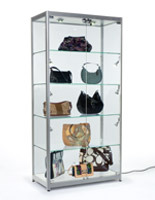 Each store fixture is a display cabinet that is for exhibition use; therefore they are easy to assemble with two people. 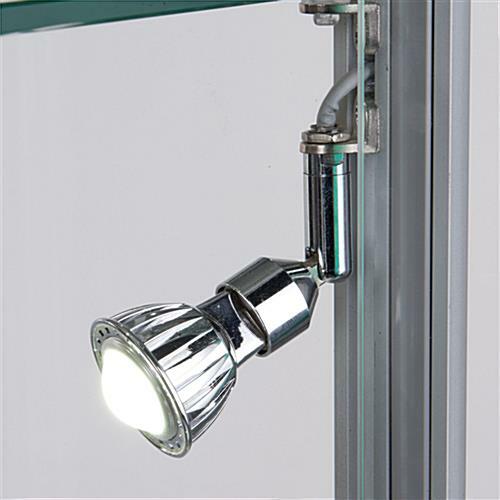 It is recommended that when assembling customers view the installation video on this page. 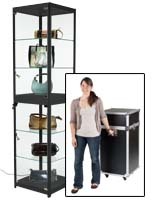 This display cabinet is tall and narrow as to not take up much space in a booth or retail store. Overall, these mobile glass cases are chosen over wooden or acrylic units because users like that customers can view the contents from all angles. Customers who choose to purchase multiple stands at a time will save money.